Can't you find a cheaper and warm place accommodation in Yokohama? Would you like to get an amazing experience? Come to Yokohama Hostel village and enjoy Yokohama!! *Charge: Budget accommodation at 3000yen or less. Saving your money you can enjoy Yokohama and other sightseeing in Japan. 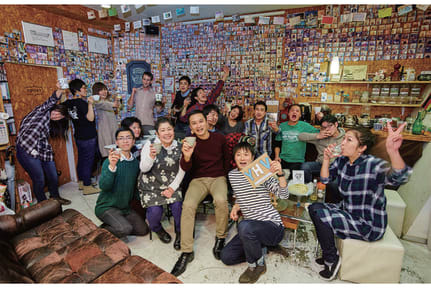 Tourists around the world & Japanese young people enjoy our hostel. Meet others and get their advice about what to see and what to do in the area. And enjoy chatting! Our customers come often and know about us through word-of-mouth. Party, Movie Night, Darts, Card games, dinner, going out---- and more! by renovating old hostel rooms and improving the image of the Kotobuki district. after the economic recession in the nineties. into a productive district that can even contribute economically. Through our hostel visitors we intend to communicate our policy and projects for the revitalization of the Kotobuki district to people all over the world. I enjoyed very much your worm hospitality very much. I will definitely come there when I visit Yokohama again. I will also inform every one visiting Yokohama from Sri Lanka to stay at your place. *Room Size: 5 sq.m. / Space that you can feel the history of Yokohama. Check the detail as below. *Roof top garden /sometimes party there. *On the1st floor, you can meet a cheerful old lady. The room is just the right amount of space for one. ( 1 or 2 people can stay in a room. With a surprisingly circumscribed and snug space, are you prepared to stay over with your counterpart?! This is the duo challenger plan! The room is just the right amount of space for one. Two can stay, but it really is a small room... Up until now numerous friends, couples, families, and others have had fun, been surprised, and angered while they challenged themselves to stay at this room. Some even deepened their bonds through their experience! Yokohama Hostel Village (YHV) challenges you to our surprisingly small room! Achieve such a task and be certified a challenger as well as a great memory to look back on! Welcome challengers, why dont you try yourselves to our amazingly small room! -Be surprised at the confines, and not grumble. Just laugh! -To share and note your experiences to the next challengers! -To take pictures of yourselves, and upload it at your blogs and homepages! 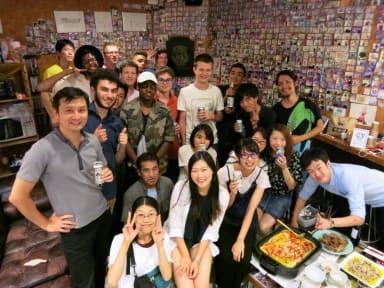 For those that have safely completed their challenge, along with certification, you will have gone through a valuable and personal experience to the extent of how small a Japanese room can be. Now, what are you waiting for? Why not challenge it yourself? Have had fun, been surprised, noted the limited space, and enjoyed their stay. Indeed, many reactions have been observed. Regardless, we congratulate such customers! Even as of now, we have several challengers. We see how they walk out to the neighboring Chinatown with smiles on their faces. We wonder whether it is really that fun. We note how it seems that people get closer to each other as the day goes by. We concluded how it must be because that the small confine of the room that encourages bonding, whether it be through more communication and interaction. So, we wait for more brave challengers to make their reservation to Yokohama Hostel Village (YHV)! 4minutes walk from Ishikawacho station and 5 minutes to Yokohama China Town. To Minato Mirai(Shopping area): 40mins by walk or 20mins by bycicle. To Pacifico Yokohama(Conference Center): 40mins by walk or 20mins by bycicle. To Koganecho（a kind of art area）:40 mins by walk or 10mins by bycicle. The place has exceeded my expectation for its price and location. You can rent a bike and go anywhere. The private room with refridgerator and ac is great. The dormitory atmosphere is compensated by careful maintainance and management of the public space (the shares bath and a simple kitchen). A roof garden where you can hang your clothes and overlook the highway and the canal is fantastic. I also enjoy the serenity of the neighborhood and would like to come back next time. Good place near where we worked which is obansashi Hall. Large rooftop smoking area which is important for us. No heating in the toilet though. I did not like the rooms, there is no lobby to hang out with people. Internet in some areas only. The rooms are very old and humid, smell very bad. Six floors without lift. The toilets are OK but the howl building smells bad. The kitchen is less then minimal. I was happy that I didn't have to spend more than one night there. Compare to the other hostels I have been in in Japan it's really disappointing for the price, even if it's not worse than the avarage hostel you'll find in Europe for the same price to have a single room. Stayed here to visit a friend in Yokohama but left it late to book. Basic facilities in a poor location. Staff were friendly. Value for money is not great. The rooms are pretty grubby and located across the street from the office - I may have been the only visitor during the time, as all the other guests I saw were Japanese who appeared to be living in the hostel during the tourist-quiet winter months. They smoked in the corridor which was a bit smelly. The wifi didn't reach my bedroom, which wasn't very good. The atmosphere during summer might be nice when there are some other guests as there is a nice roof garden. Poor area and overpriced. The building is old, the rooms are Ok, the neighborhood at night is not that nice, and the main desk is at front and closed by 9pm.....in case you need something and they don’t take credit card! Not a good option! Room had a funky smell to it. Sort of located in the slums of Yokohama. Fine for 1 night, but most definetely no longer than that. We were charge $10000 yen to spend 2 nights at this hostel. We got a room of a queen size bed for 2 people. This is not a joke that was the size of the room. We had 2 mats and 50 cm extra space at the bottom of the mat. It had a shelf to put the luggage. That is it. There is no common areas with chairs to eat, shower wasn't working, bathroom was dirty. Definitely this is the worst hostel we have ever stayed.